Matt Montgomery Group is one of greater Boston’s premier residential real estate sales and marketing teams. The team was founded in 2012 by long-time agent Matthew Montgomery, who has personally participated in nearly one billion dollars of residential real estate sales. 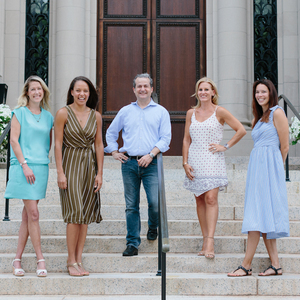 Matt and his team spent 16 years at Hammond Residential before joining Compass as founding members of the Chestnut Hill office in December 2016 after Hammond was sold to a large competitor, and are confident they will help Compass build the area’s premier full service firm and luxury brand for residential real estate sales. Matt has proven himself to be a constant force in the market and has built not only one of the top residential real estate teams in Newton and Brookline, but also one of the top teams in Massachusetts. Matt developed this strategy starting in 2000, and over the past four years he has expanded his proven team approach. He has cultivated a group of top agents which includes Lauren Carroll, Kelly Farrell Salem, Ashley Desmond and select others, who along with his long-time operations associate Katie Faraone partner with him to continue growing and refining the exceptional service his team provides. Together this established team has proven itself to be the most consistently productive in the market, and also a group completely committed to servicing their diverse buyer and seller clients at the highest possible level regardless of price point. While Matt and his team focus on their buyer and seller business in Newton and Brookline, they also provide exceptional service in surrounding areas. In particular, agent Ashley Desmond is one of the top agents for buyers in the state. She brings an unparalleled commitment to her buyer clients across all price points in the greater Boston area, including downtown, Metro West, as well as the North and South Shores.